Spotify and SoundCloud are two of biggest and most popular music streaming services today, but they are distinct in some aspects, just like Netflix different from YouTube. Spotify generally works with the major record labels and distributors to get officially licensed music into it’s system. SoundCloud lets anyone upload their own music (just like the way that users upload videos to YouTube), and a lot of artist (famous or not) can post the remixes and originals. It is has nearly 175 million tracks and you will find some tracks that you can not find on Spotify and other platforms. As an avid music lover, we usually use these 2 platforms together to catering different music tastes. If you want to integrate SoundCloud music or playlist to Spotify library, or if you want to move service from SoundCloud to Spotify, you are allowed to transfer SoundCloud music or playlist to Spotify library. 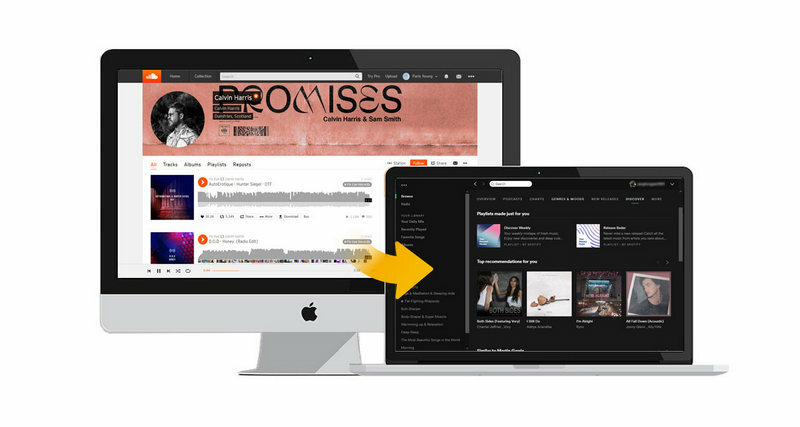 There are many online services to let you transfer playlist between SoundCloud and Spotify, but today we would like to introduce a way we often used. Any Video Converter is regarded as one of the best online video (music included) downloader which is capable of free downloading HD videos and music files from YouTube, SoundCloud, VEVO, Vimeo, Howcast and other 100+ sites. 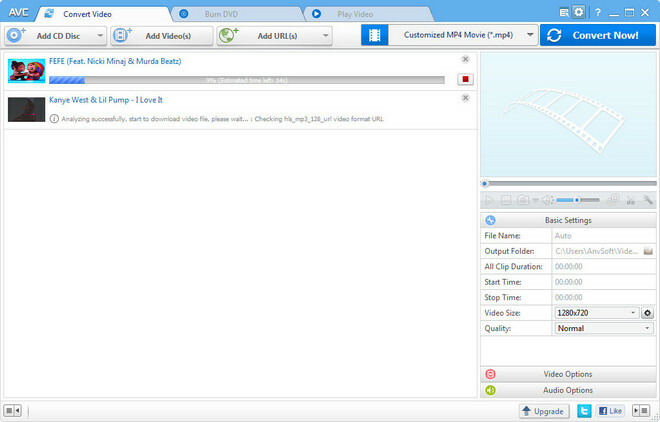 Here we will show you how to use Any Video Converter to download SoundCloud music or playlist to MP3 for free! Install Any Video Converter Free on your computer and run this freeware. Open SoundCloud site on Chrome or Firefox browser and find the music or playlist you want to download. Then click "Share" icon and a pop-up window will be shown to indicate you copying the song or playlist link. 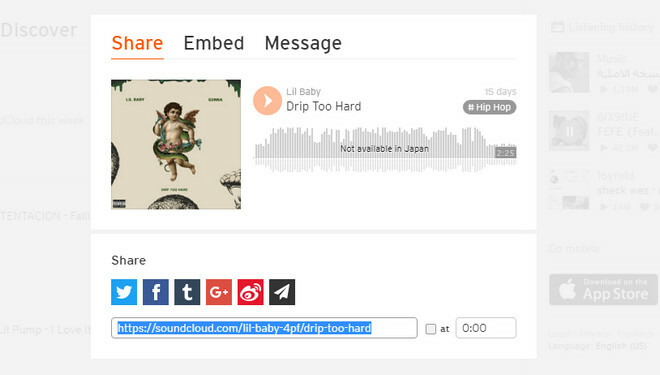 Then click "Add URL(s)" button to add SoundCloud song or playlist. A new window will be shown you can click button to paste the song or playlist link. Or you can drag & drop a song or playlist from SoundCloud to the adding window directly. Now click on "Start Download" button to start downloading SoundClound music or playlist, and you can continue to add more songs or playlists to download SoundCloud music in batch. After the downloading process completed, you can right-click the track and select "Open Source File Location" to find the well downloaded SoundCloud music or playlist in a folder named "SoundCloud", and the default output format is .mp3. If you want other output format, you can use Any Video Converter Free to convert SoundCloud music to other popular format like AAC, FLAC, WAV, OGG, APE and more. 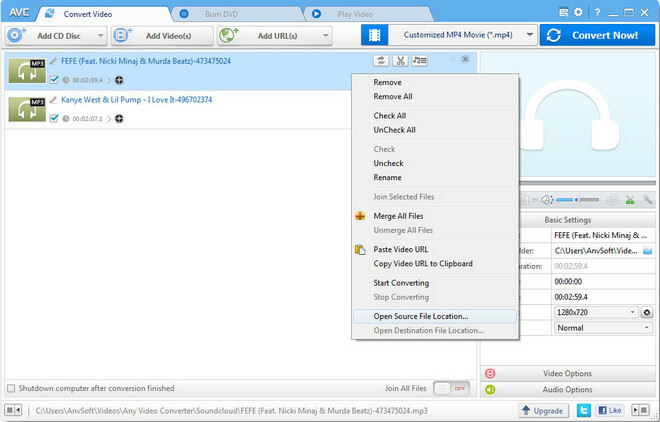 With Any Video Converter Free, you will get MP3 copies of SoundCloud music. The output audio will be stored on local directory, and you can launch Spotify app on computer and start importing SoundCloud music or playlist from local folder to Spotify. Windows user can find it under icon and select it under "Edit". 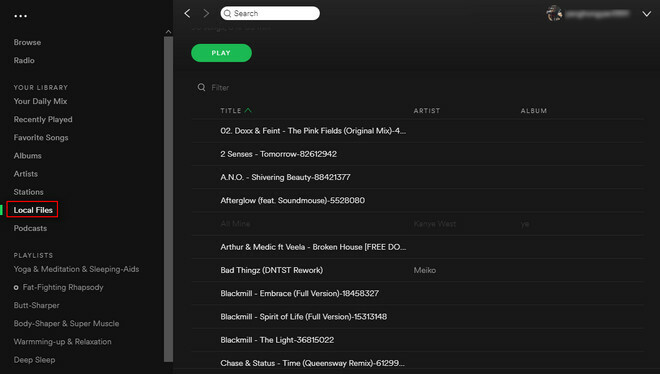 Mac users can find it under "Spotify". 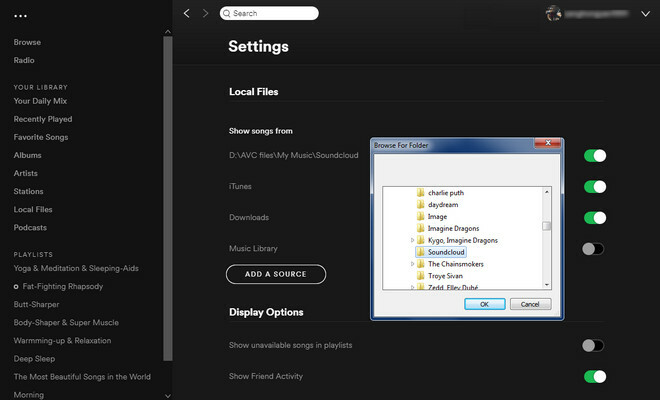 Scroll down to "Local File" section and click "ADD A SOURCE" to select SoundCloud folder and click "OK" to start importing SoundCloud music to Spotify. The whole folder will be added to Spotify library immediately. You will find them by clicking "Local Files" tab on the right panel. If you like, you can create a new playlist and add the SoundCloud music to playlist. 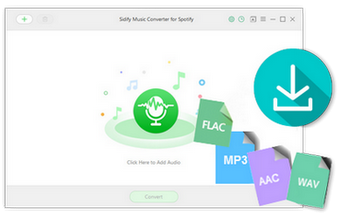 If you are looking for a way to download music from Spotify to MP3 or other plain format on your computer with the best sound quality kept, Sidify Music Converter for Spotify is right here worthy of trying. Highly compatible with the latest Mac/ Windows OS and Spotify.